Not your grandma's macrame bag, this jet black update by Lizzie Fortunato has sleek editorial handles. 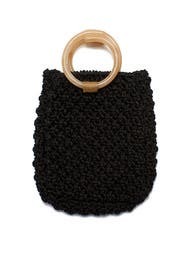 Black woven fabric handbag with acrylic top handles. Open interior. 6"L x 7.5"H x 3"D.